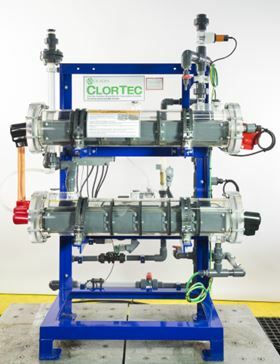 De Nora Water Technologies has improved the ClorTec on-site sodium hypochlorite generation systems. Each of the systems’ cells is now vented for safe, efficient operation. The new systems are claimed to consume less salt and power than competing electrochlorination systems. De Nora says that ClorTec systems generate a 0.8% sodium hypochlorite disinfection solution, a chlorine equivalent, using only salt, water and electricity. ClorTec units range in capacity from up to 1 kg/day (2 lb/day) to 1,360+ kg/day (3,000+ lb/day). In order to meet varying application-specific conditions, the company says that the ClorTec units are available as component-based or skid-based packaged systems. On-site sodium hypochlorite generation is designed to offer a cost-effective, reliable and safe alternative to disinfection using chlorine gas or bulk sodium hypochlorite. On-site generated sodium hypochlorite is stable and easy to feed. Additionally, less chlorine is released to the atmosphere because of better mixing and retention in the treated water.